Nothing can beat Filipinos’ way of celebrating Christmas. From enchanting Christmas decors and lights that are up beginning September to attending simbang gabi for 9 consecutive mornings and the delectable Christmas dishes served during Noche Buena shared by the members of the family. Aside from gifts that we receive, these traditions make our celebration unique and memorable. 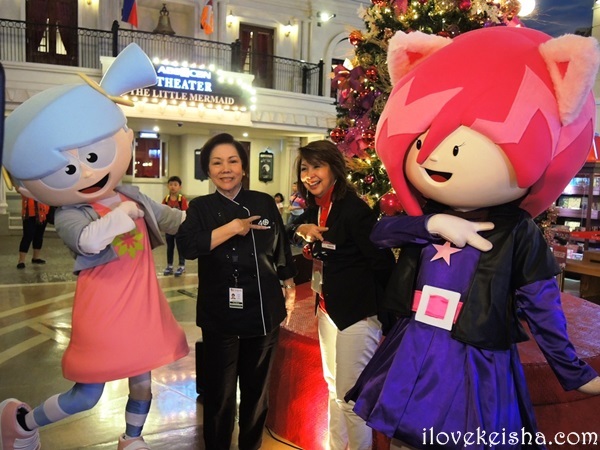 And, this holiday season, KidZania Manila is rekindling the magical experience that only a Filipino Christmas can bring with Paskong Kai Saya sa KidZania Manila. 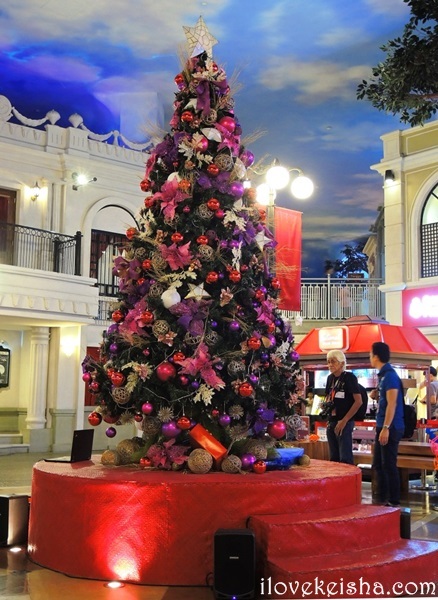 Kids and kids-at-heart will have a taste of homegrown Filipino Christmas traditions when they visit this play city. 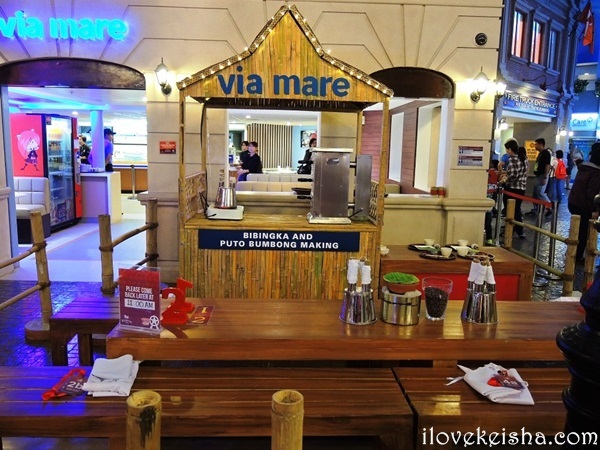 Lots of fun and exciting activities are in store for the kids that tie-in notable Filipino traditions with the values KidZania upholds – To Know, To Care, To Share, To Play, To Create, and To Be. 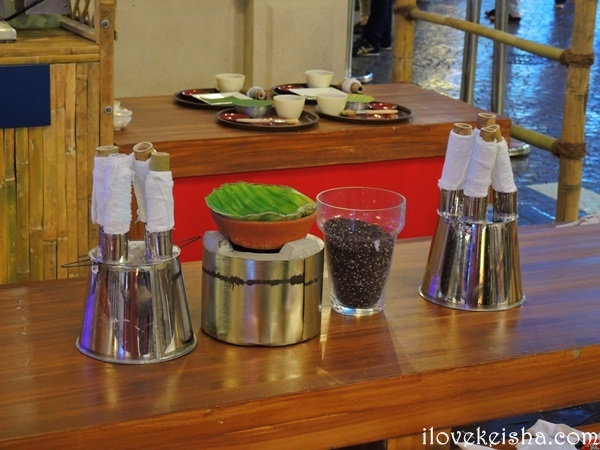 These interactive activities are located at the main square of the play city. 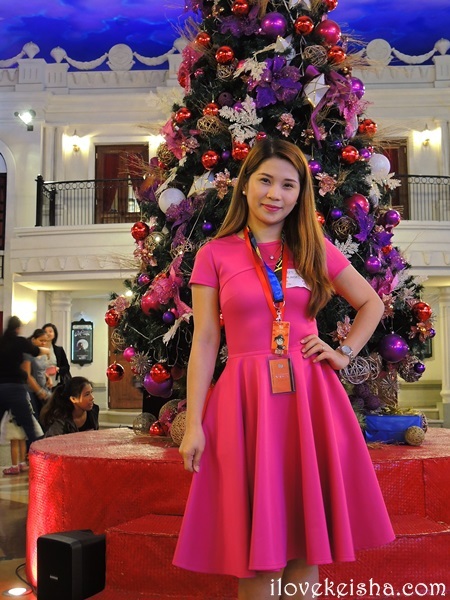 I had a taste of Paskong Kai Saya sa KidZania Manila yesterday when I visited and witnessed the Christmas tree lighting ceremony held at the main square of KidZania. 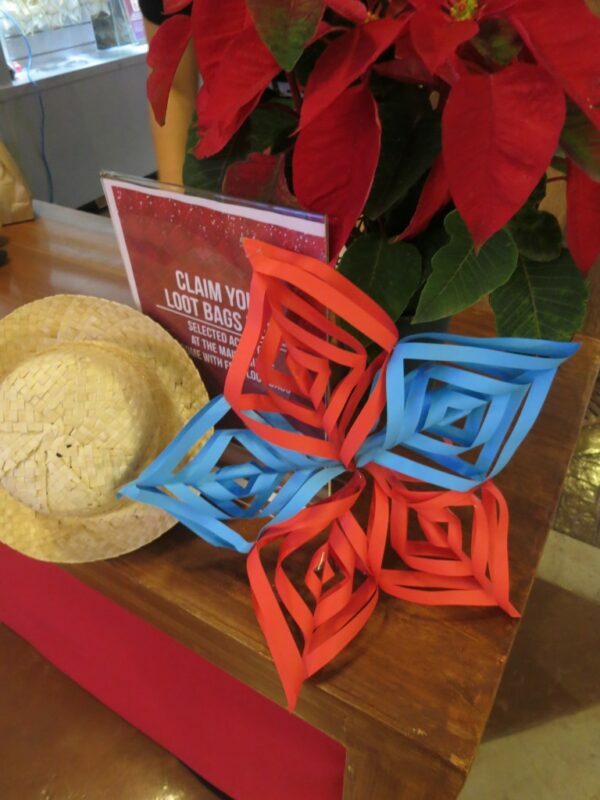 Their Christmas tree is accented with capiz ornaments, and topped with a classic Filipino parol. Present during the event were the State Governor, Ms. Maricel Pangilinan-Arenas and the owner of Via Mare, Chef Glenda Baretto. 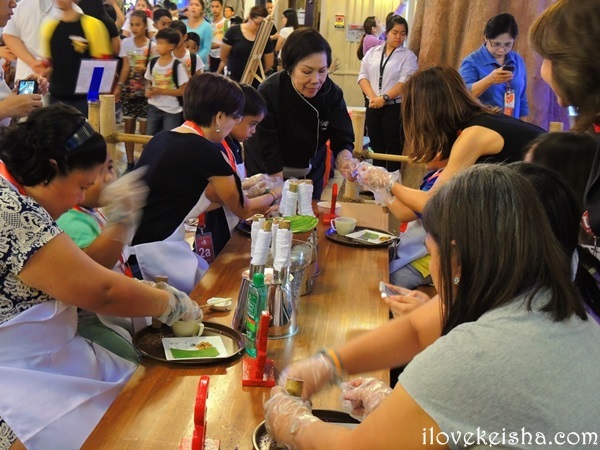 Since puto bumbong and bibingka are a huge hit during Christmas season, Chef Glenda of Via Mare personally demonstrated how to make their famous and delish specialties to a group of moms and kids. 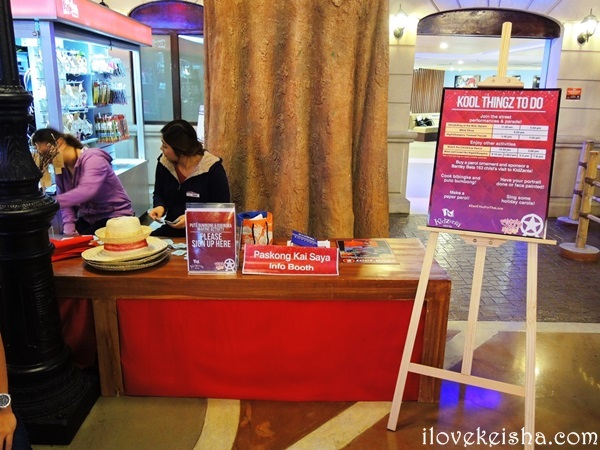 Once you settled in KidZania, you may proceed to Paskong Kai Saya Info Booth to know more about the Christmas activities as well as the schedule. The Zupervisors will gladly assist you on how you can sign-up for the activities to join in the fun. This is located at the main square near the giant Christmas tree. 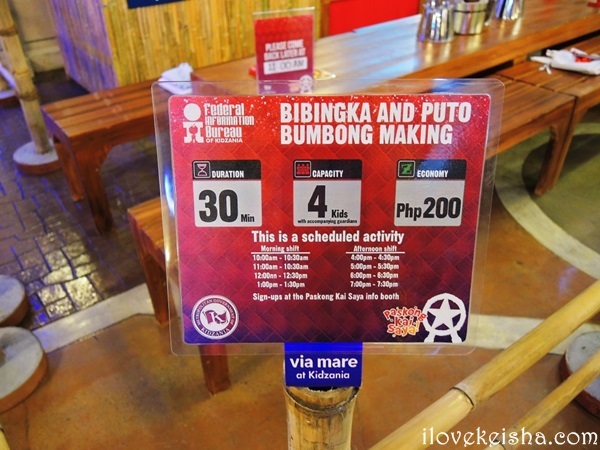 KidZania Manila and Via Mare present a delicious learning activity for kids: making their favorite puto bumbong and bibingka. Kids can unleash their imagination, be crafty and make their own colorful paper lanterns at the Paper Parol-Making Station. At the Acting Academy, kids can experience the simple joys of Christmas caroling with instruments made of recycled materials, including drums, coconut-shell maracas, and bottle-cap (or tansan) tambourines. Apart from these fun activities, families can go home with loot bags filled with special treats from participating Industry Partners: Mercury Drug, Green Cross, Champion, Nestle, McDonald’s, Oishi, Universal Robina Corporation, Pioneer, Toy Kingdom, and Coca Cola. 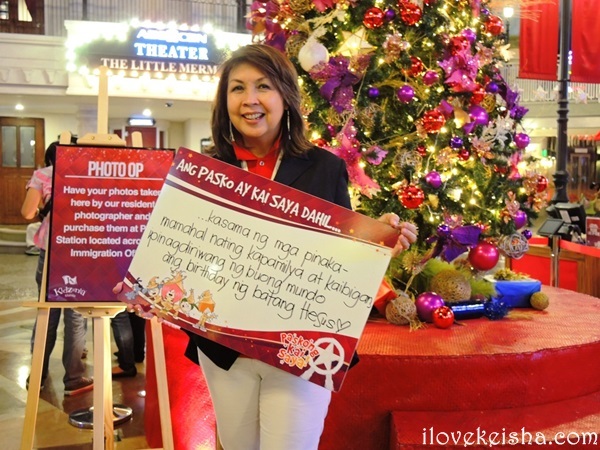 Misters and misses can even spread the love and share their positive Christmas messages to others by completing the sentence “Ang Pasko ay Kai Saya dahil…” on the message board near the Christmas tree. Developed pictures can be purchased at the PikZ station after the session, to commemorate the moment. 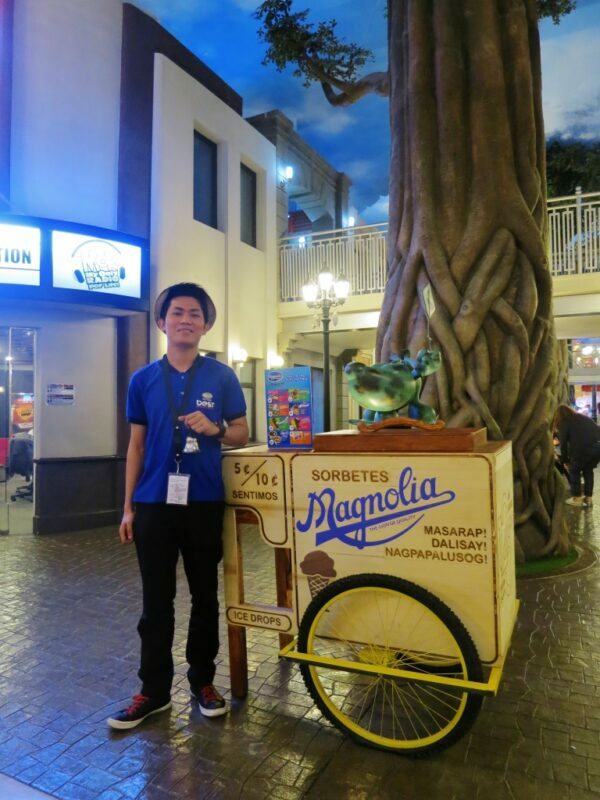 A vintage ice cream cart from Magnolia, manned by friendly Mamang Sorbetero, is stationed at the main square if in case you wish to indulge to some treats. 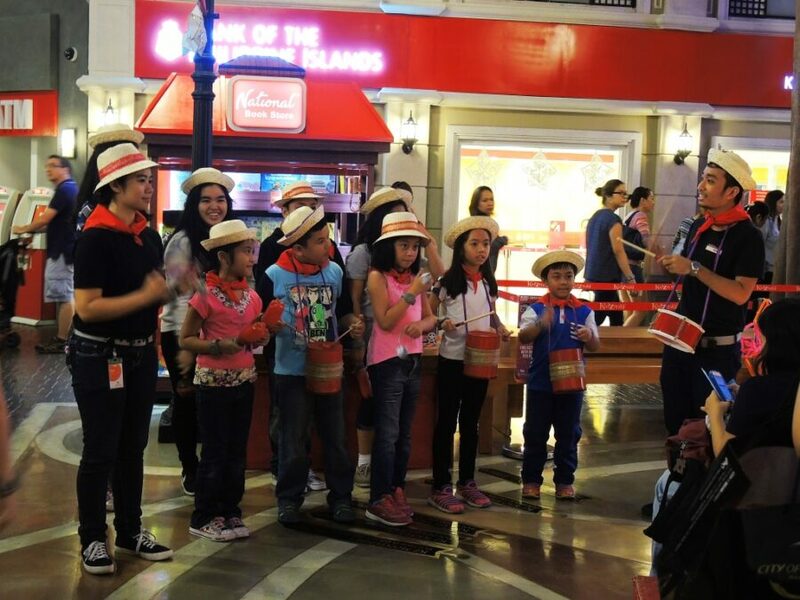 To celebrate the spirit of giving and sharing, kids can be part of KidZania para sa Bantay Bata. 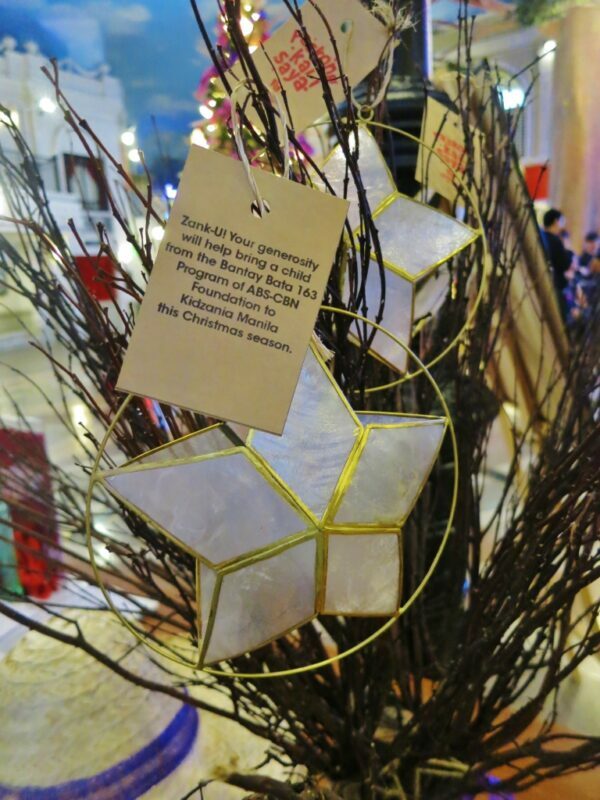 Misters and misses can purchase star-shaped Paskong Kai Saya capiz ornaments for only P350 that they can hang on their tree at home. 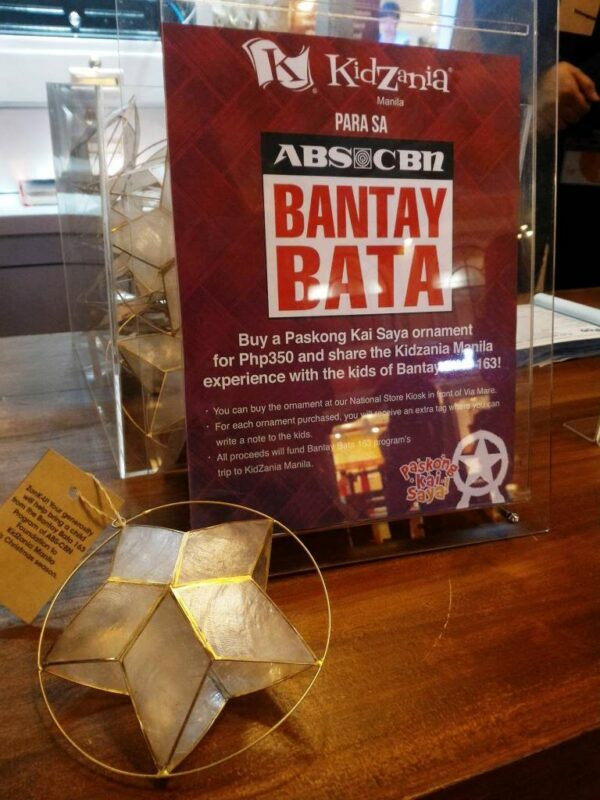 All proceeds from the sales of these trimmings can help send the kids of ABS-CBN Foundation’s Bantay Bata program to KidZania Manila to experience the marvels of the play city. I highly encourage everyone to be a part of Paskong Kai Saya sa KidZania Manila and support KidZania para sa Bantay Bata program! Let’s all be an instrument to give joy to less-fortunate kids. 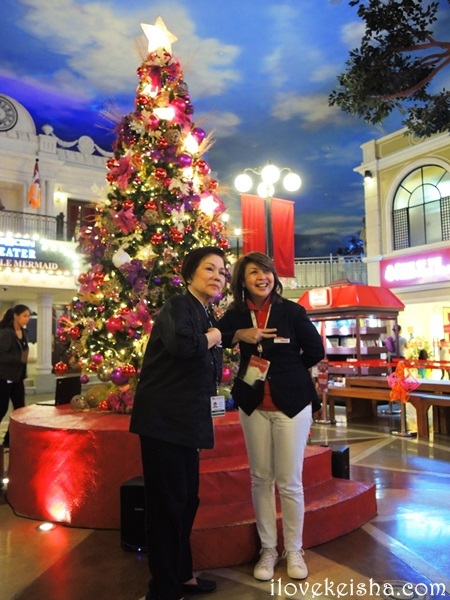 Christmas activities will run all the way up to January 15, 2016. Visit from 9AM to 2PM, or from 3PM to 8PM to learn and have fun role-playing different careers. To book tickets and for more information, visit manila.kidzania.com now.